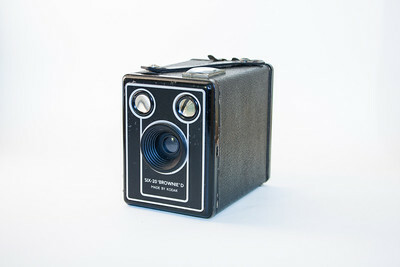 Scott Andrew Bird's collection of vintage cameras - TLRs, Folders, Half-Frames and a whole lot more. Rolleiflex T The Rolleiflex TLR (twin lens reflex) medium format range was introduced in 1929, and continued with comparitively minor changes until 1993. 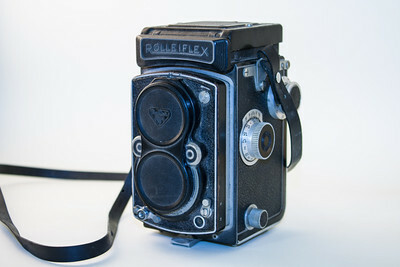 The Rolleiflex T (this one) was released circa 1962. 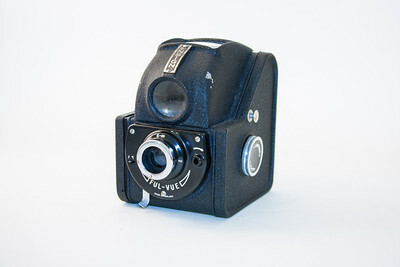 The Rolleiflex T was the sister version of the Rolleicord (the consumer model) and used 120 roll film. 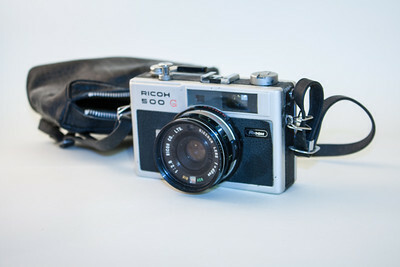 Ricoh 500G The Ricoh 500G is a rangefinder camera, featuring a 40mm f2.8 lens. The 500G had shutter priority and a display in the viewfinder. 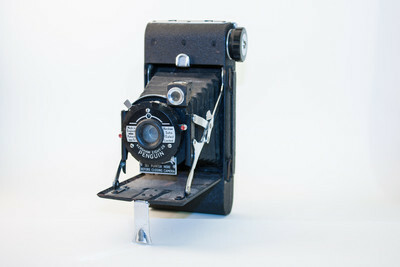 Kodak Junior 620 The Kodak Junior 620 was a folding camera produced in Germany from 1933 - 1939. 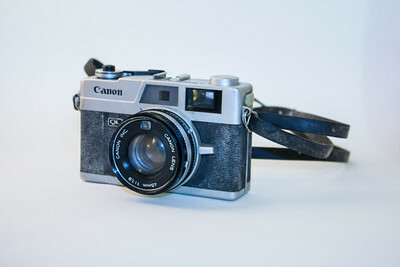 As the name implies, this camera used 620 roll film. 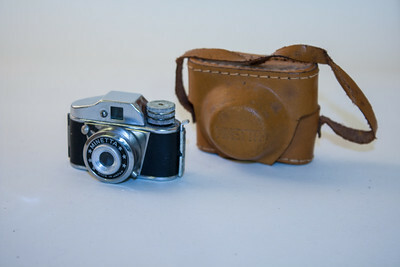 Ensign Selfix 20 This is a 1950s folding camera made by Barnet-Ensign. 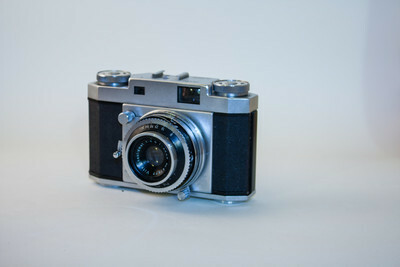 It features a 100mm 'Ensar' f4.5 Anastigmat lens, and uses type '20' film to produce 2.25" x 3.25" negatives. 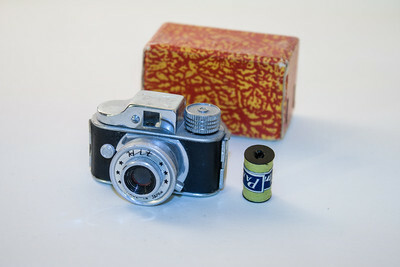 Buying film for this camera : Type 20 film is still available, though somewhat uncommon. The best place I've found is the German site Lumiere. Kodak 1A Junior Autographic These folding cameras were produced from 1914-1927. The body itself is wooden, whilst the front and back are metal. NB : since taking this photo, I've managed to get the bellows open. Some serious restoration work (and a new photo) coming shortly. 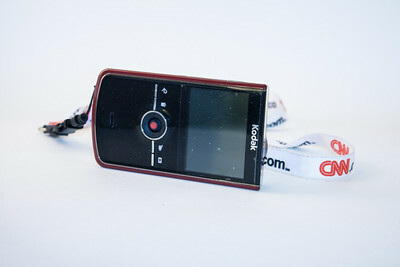 The cameras used Kodak Autographic film which permitted the writing of a short message between frames. 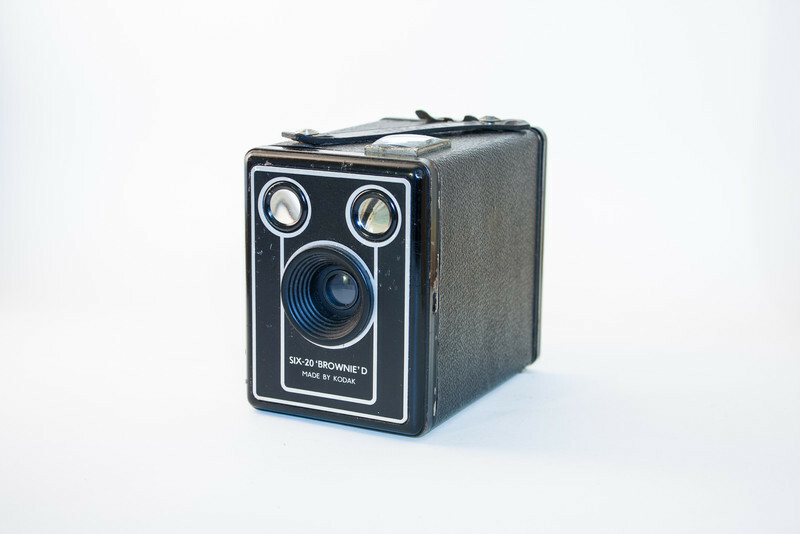 A layer of carbon paper was wound between the film and a red backing paper, and after a photograph was taken, a small door at the back of the camera could be opened and the paper written on with a provided stylus. This would then be held to the light for a moment, transferring the text onto the film. Voigtlander Vitoret The German made Voigtlander Vitoret was introduced in 1963, shortly before Voigtlander was taken over by Zeiss Ikon. 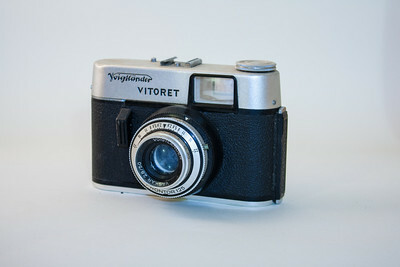 The Vitoret was manufactured until the early 1970s when Voigtlander was sold on to Rollei. 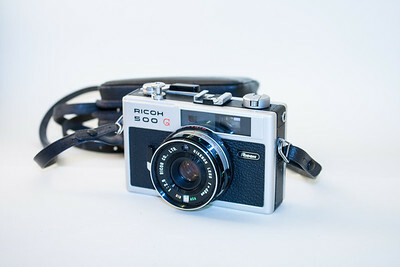 Ricoh 35s Ricoh released around 50 cameras from 1953 to 1960, including the 35s in 1957. This rangefinder camera featured a 45mm f2.8 lens, a Riken shutter, and shutter speeds from 1/10th - 1/300th sec; plus a bulb timer. Coronet Viscount The Viscount is a fairly simple viewfinder camera made by Coronet around1957 in Birmingham, England. 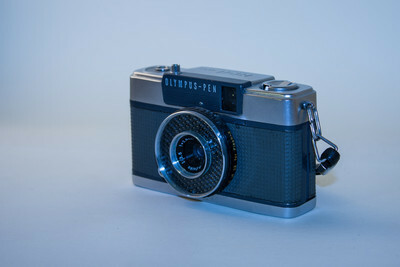 It has a two speed + B shutter, 1/100 and 1/30 with flash sync via a PC socket. The unnamed single-element fixed-focus lens has a choice of two apertures, f8 and f16. 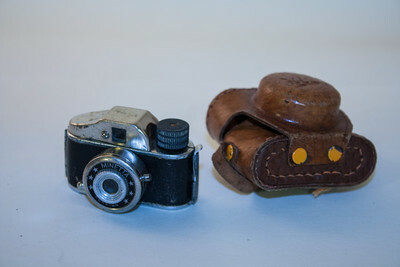 The shutter release is a black triangular plastic lever on the side of the lens barrel. The body is mostly plastic, with pressed steel diamond-patterned top and bottom plates. 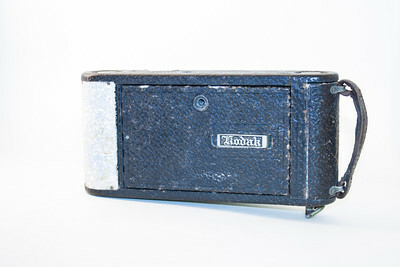 The back and bottom plate are removable for film loading. 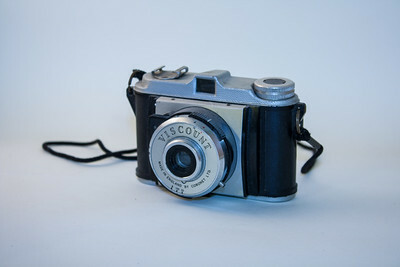 The Viscount uses 828 film, taking 28x40mm images. 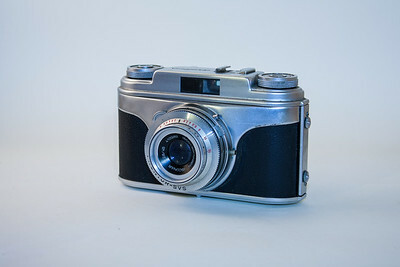 Ensign Ful-Vue This camera was produced in the late '40s by Barnet-Ensign, London. 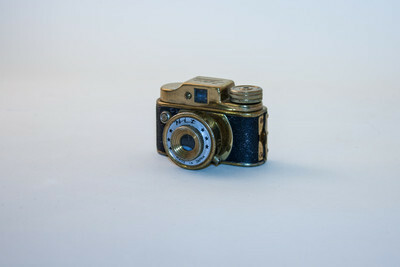 Apparate & Kamerabau Arette 1A This item is an Arette 1A 35mm camera made by Apparate & Kamerabau of Germany in 1957. (This is the later version with the bright-frame viewfinder). 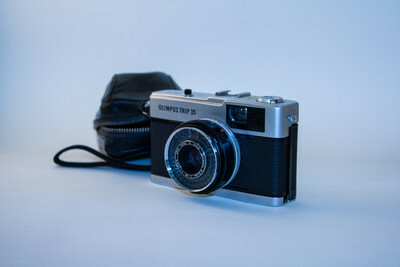 This good quality camera is fitted with an isconar f2.8/45 lens and a prontor-SVS shutter. 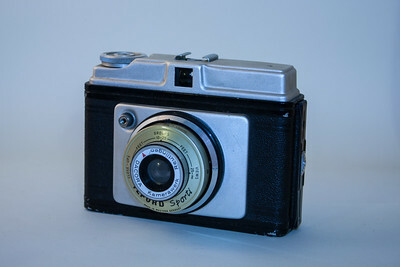 Meisupii Half This is a half-frame camera made by Tougodo sometime around 1962. 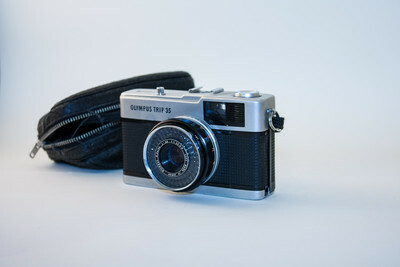 Inspired by the Olympus Pen, the Meisupii has no meter and a 8.0/40 Sankor lens. 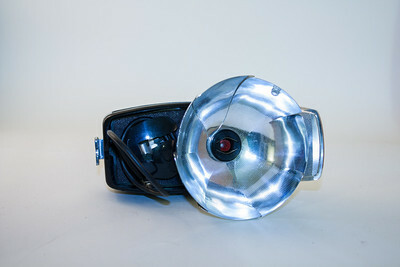 This one still has the original external flash unit, which is much larger than the camera itself. Pentacon Prakti The Pentacon Prakti is a motorised 35mm manufactured in the former GDR, in 1960. 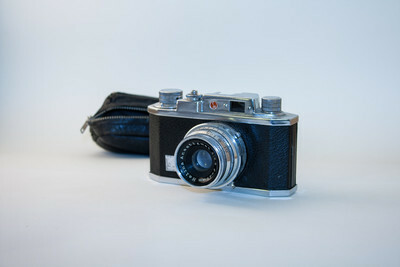 It's a rangefinder with a fixed 40mm f3.5 Meyer-Optik Domiton lens. Kodak 620 Brownie D This camera, one of the wonderful Kodak Brownies, is in superb condition. Kodak Brownie Reflex 20 This was the end of the line as far as Kodak's production of cameras for its 620 film (6cmx6cm negatives). 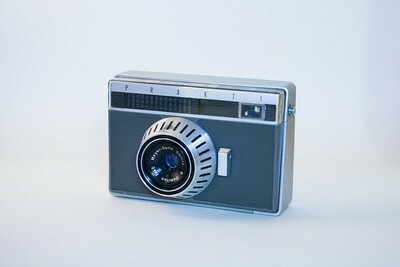 In the US the Reflex 20 was produced between 1959 and 1966; in the UK the production run was a slightly shorter 1960-1965. 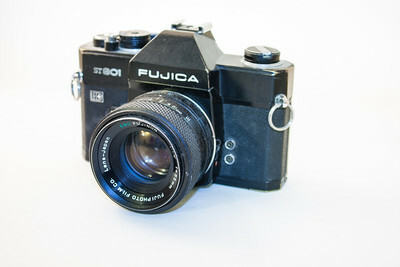 This TLR-style camera has an f/11 meniscus lens (f/20 and f/26 lenses were also available), and the shutter is fixed at 1/40th sec. Three aperture stops are available, which allow the use of colour film. Kodak, Brownie & Hawkeye 620 Rollfilm Cameras user.itl.net/~kypfer/620roll.htm Using 120 Film in a 620 Camera www.toptown.com/nowhere/kypfer/120-620faq.htm. 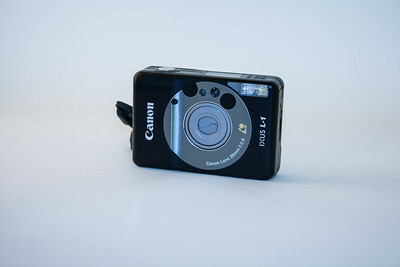 Canon Ixus L-1 In Australia this camera is known as Elph, and a digital model is now available. 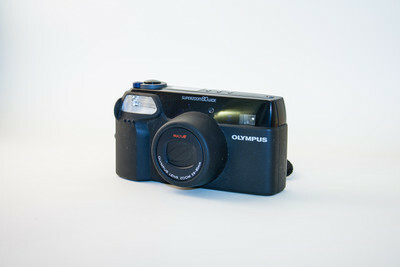 I bought this in London primarily for capturing shots of friends at parties; the camera comfortably fits in a pocket. 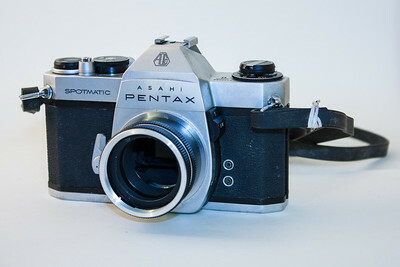 Pentax Spotmatic SPii This camera was introduced in 1971. 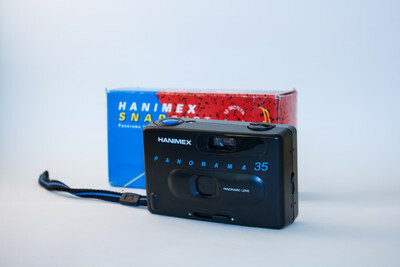 It featured match needle metering, depth of field preview, and was the last camera I purchased which used screw-mount lenses. Kodak Zi8 I love this camera. I use it as a 'just in case' device - the camera I take everywhere. Nice and compact, both video and stills, and an external microphone jack. Incidentally, that last point is one of the key differences between this and something like the Flip. If you care about audio, it's a must. Great little thing. HIT Finally, a HIT. 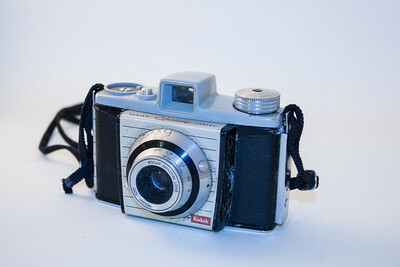 Good condition, with box and a roll of film. Love it. Minetta Foreign This is another beautiful camera, although in slightly poorer condition than the Minetta I acquired recently. 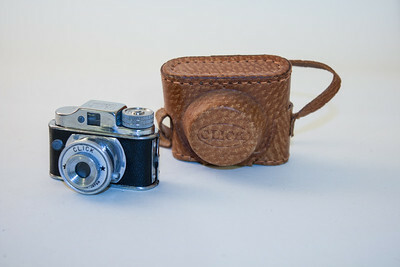 It did, however, come with a HIT leather case (pictured) and two rolls of 17.5mm film. Very nice. 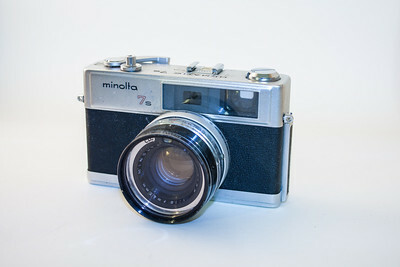 Unfortunately - as with the other Minettas - not much is known about this camera. At a guess, I would say it was constructed in Japan sometime around 1960; presumably for an overseas market. If you can help flesh out the Minetta story, please let me know. Purma Special The Purma Special was introduced in 1937 and manufactured until 1951. 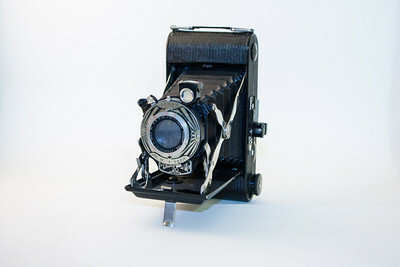 This was a particularly unusual-looking bakelite camera, featuring a unique shutter and lens mechanism. 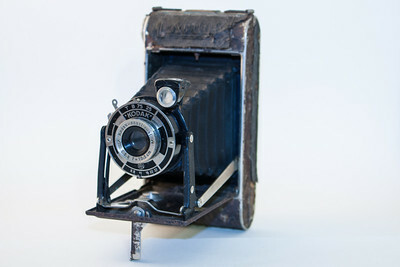 The lens was spring loaded, being pushed back into the camera when the lens cap was replaced; preventing the photographer from making an exposure whilst the cap was on. 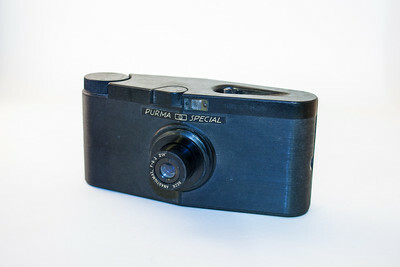 The Purma Special takes 16 1.25 inch square photos on a 127mm film. Two red windows on the rear of the camera are used to align the frame when advancing the film. Kodak Instamatic 104 These cameras were manufactured from 1965-1968, and this one appears to have been used solidly since then. 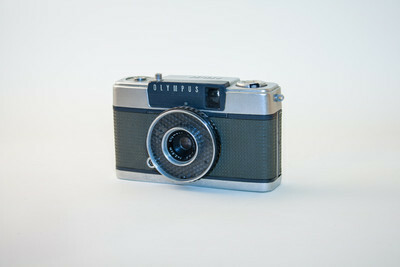 Specs : f/11 43mm lens, shutter speeds of 1/40 and 1/90, uses 126 cartridge film giving a negative size of 28x28mm. Originally sold for US$15.95. They used flashcubes rather than individual bulbs (invoking memories of my earliest photographic attempts). 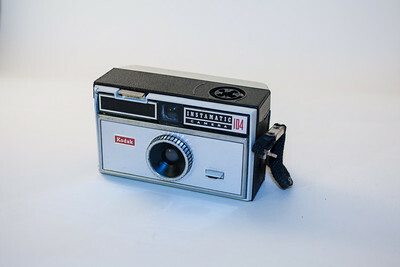 Kodak Bantam Colorsnap The Kodak Bantam range was produced from 1955 to 1989. 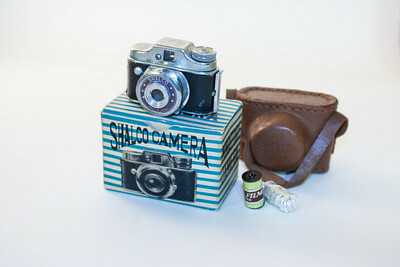 The Colorsnap was UK-made and designed to encourage people to use Kodachrome colour film. 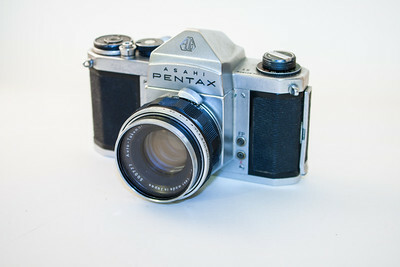 Pentax S1 The Pentax S1 was manufactured from 1961 - 1966. Before this one landed in my hands, it was used for several years by my father to capture the tears and joy of Formula One motor racing around Australia. It featured (despite what was advertised at the time) shutter speeds up to 1/1000th of a second. 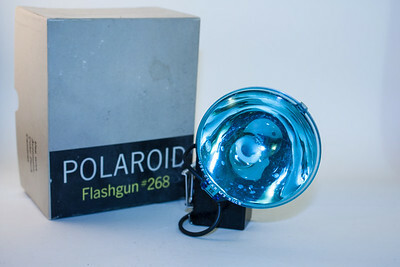 Polaroid Flashgun #268 Polaroid Flashgun, still boxed. 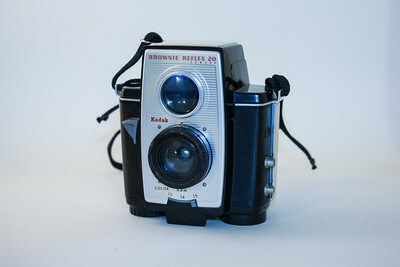 Kodak Brownie Reflex One of many forerunners to the Brownie Reflex 20, this camera dates to about 1940. 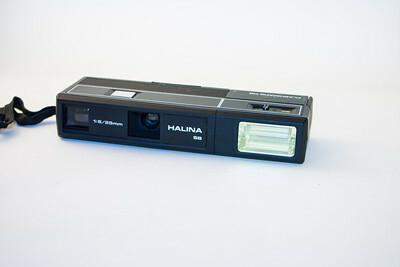 Halina Sharpshooter Flashmatic This is a 110 cartridge film camera which has a built-in flash, powered by two AA batteries. Minolta Hi-Matic 7S The Minolta Hi-Matic range was introduced in the early 1960s, with the Hi-Matic 7 first appearing in 1963. 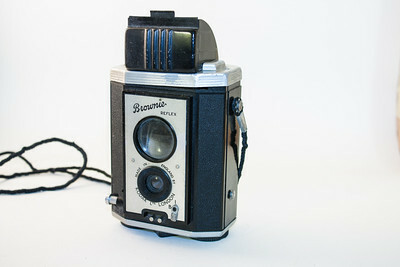 The Hi-Matic 7s (the one I currently have) added a hot shoe, but is otherwise essentially the same camera. 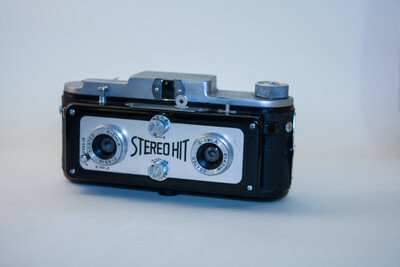 The Hi-Matic 7 and 7s were fully automatic rangefinder cameras featuring a 45mm f1.8 lens. 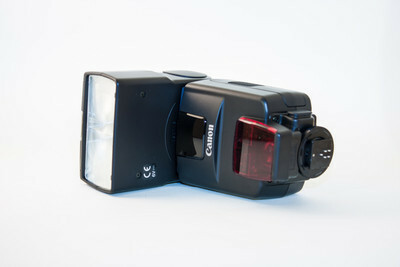 The cameras could also be used in metred manual mode. Fujica ST801 The Japanese made Fujica series began with the ST701 in 1971, followed a year later by the ST801 (although mine was manufactured in 1973). It is a fixed pentaprism SLR, uses LED metering (sort of a match needle enhancement) and has shutter speeds up to 1/2000th sec, plus Bulb. The camera I have was first purchased for 120 pounds, has a EBC Fujinon 55mm f1.8 lens, is nice and heavy and takes 35mm film. 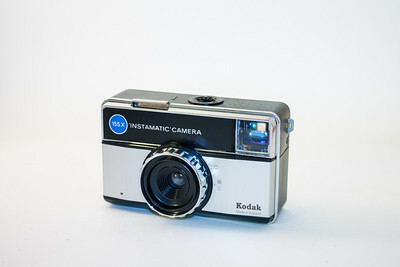 Kodak Instamatic 155x This is a 126 cartridge film camera, which takes 28x28mm negatives. 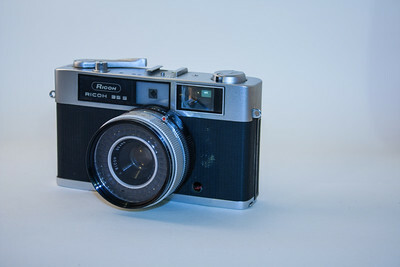 Made between 1971 an 1977, it has a fixed 43mm f/11 lens and uses Magicube flash cubes. 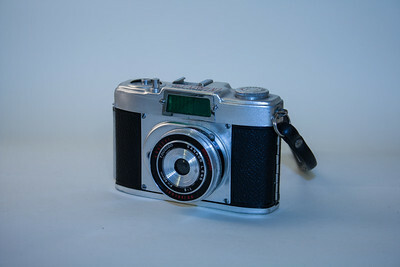 This one was made in England, however the camera was also manufactured in Germany.